Domo arigato, Mr. Roboto! In today’s fast-paced world, people tend to gravitate towards things that are easy and don’t take up too much of our time. I mean – let’s face it, our time is valuable. As I drive to work every morning, I’m always catching people on the highway alongside my car attempting to kill two birds with one stone by eating breakfast during their morning commute. Advances in technology are also making our lives much easier than the lives that our ancestors used to live. With a microwave, I can have an entire meal cooked and ready in under two minutes! Technology has made our lives easier in other ways too. For example, the way we bank, the way we communicate with our friends and family, and even the way we discover news and other information is drastically different than it was a decade ago. On QuiBids we’ve created a similar use of technology to make bidding easier for you, and it’s called Bid-O-Matic. The Bid-O-Matic is a helpful tool for those with busy lifestyles because it places your bids when you are away from your computer. Furthermore, we’d like to reward for making good use of this feature on QuiBids. 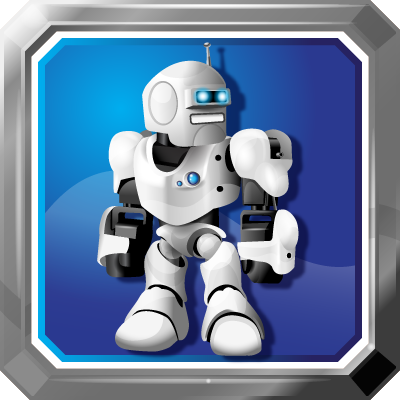 So once you use at least 20 bids with the Bid-O-Matic in one of our auctions, you will receive the Mr. Roboto Badge plus 2 FREE bids! Badges are earned achievements on QuiBids that display your bidding skills and reward you with bids! If your aim is to become a better and more successful bidder on QuiBids, try attempting to earn badges. They are a great way to gain experience on our site, set goals, and earn customer rewards. Choose the QuiBids Badge you’d like to shoot for. You can see the list of possible badges on the Badges tab on our homepage. Once you have found the badge you’d like, read the badge details explaining what is required to achieve the badge. Meet all of the objectives from step 2. Once you’ve done what is required, you should receive an email from QuiBids notifying you of your new badge! In order for the badge to appear on your profile, and for you to receive the free bids attached with it, you must first claim your badge. After you’ve claimed your badge, that’s it! You will be able to show off your shiny new achievement to all your friends and fellow QuiBidders. Be proud knowing that every badge is another step on your way to becoming a master QuiBidder.